My Camellias and Rhododendrons have their own special pages, as do my New Zealand natives. A pretentious shrub will try and sneak onto the Foliage Plants page. So the shrubs on this page are the talented left-overs. Contributions that all my shrubs make, with flowers and leaves, allow the Moosey garden to be a success. Cheapness of purchase also gives the Head Gardener many exciting design options. 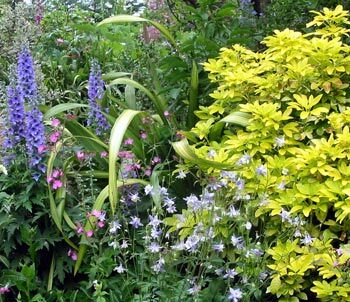 Naturally there will be good and bad shrubs for different countries and different locations. Some shrubs on my list may be undesirable, invasive, or even banned in your garden. Be alert! No respectable gardener should give shelter to anything dodgy. Until last year Pieris have been treated rather rudely in my garden. To improve their standard of living I released one from dry, substandard soil in a confining pot, and shifted another out of a sun-baked border. Grows best in partial shade? Yes, definitely. And not in a pot. Sorry about that. Books about shrubs for the sensible gardener always mention a Philadelphus, or Mock Orange. Thoughtful gardeners include at least one in their shrubberies. I've found a Philadelphus in the original plantings on one side of the Moosey house. Some shrubs get into my garden as grateful refugees, others as happy accidents. My two standard Exochordas were sitting around in a local nursery going nowhere, and when I saw their common name was 'The Bride' I was hooked. Shrubs which colour beautifully in the autumn and winter months are worth their weight in gold - or should that be 'red'? The ornamental shrub called Nandina is one such. In my garden the middle summer weeks are filled with harsh sunlight, and flower colours tend to get lost in the glare. It's a scruffy, down-time time of year for flowering things. Yippee for my naughty Buddleias! Would it be rude to describe Rosemary as a 'work-horse' in the garden? My Rosemary shrubs are just that - they work hard filling their space, gift their beautiful blue flowers freely in spring, and never complain. But is she a shrub or woody perennial herb? Either! There were already three Daphne bushes in the garden when I first came to Mooseys Country Garden - in a small area by the washing line, with lavenders and some herbs. These early plantings make hanging the clothes on the line more enjoyable! Chiosya Ternata, or Mexican Orange Blossom, is one of those shrubs which never fails its situation in the garden. It's evergreen with mid to dark green shiny leaves - easy to keep trimmed and tidy. It flowers generously throughout spring. Garden colour in the middle of winter should be cherished! The Leucadendron 'Safari Sunset' is a truly beautiful winter shrub with its warm red bracts. This euphorbia is usually considered half perennial half shrub. The flower colour is a rich deep orange with red, and the flowers appear in summer. There were many Viburnum Tinus shrubs here in the garden when I arrived - or rather they were dotted around in some of the lawn areas. I moved them into the garden proper as quickly as possible, then stood back and watched them grow.